Picture this: you’re visiting friends at their lake house when your allergies start acting up. You pop an over-the-counter pill — which usually gives you quick relief — but you still feel uncomfortable. In fact, after several more doses, the drug still has no effect. What gives? Think long and hard where your medication was stored. Was it in your car’s trunk or the airplane’s cargo hold, both of which can get extremely hot? How about before that? Was it in the humid medicine cabinet in your bathroom? Keep medicines in a cool, dry place—despite the name, the medicine cabinet is often the worst place to store drugs because of the frequent high humidity in the bathroom. Don’t have air conditioning? Consult with your pharmacist to determine next steps — depending on the medication, they may recommend your refrigerator, or even a basement or power room without windows. Leave drugs in their original packaging to decrease the risk of elements exposure. Exception: elderly or chronically-ill patients who need pill boxes to help with dosage accuracy. Carry your medicines onto the airplane since baggage holds are not controlled for temperature. (You should never check necessary medications anyway, since you could miss doses if your luggage goes missing!) Note: Security procedures allow for carry-on medicines in pill or solid form in unlimited amounts as long as it’s screened. Medically-required liquid medications are permitted in carry-ons in excess of 3.4 ounces without a zip-top bag, but you must tell the officer that you have medically-necessary liquids with you at the start of the screening process. Don’t want your medications screened by x-ray? (For example, medications like epinephrine could be damaged during the x-raying process).You must make that request known to a TSA Agent before screening begins. Take medications with you when you leave the car, even briefly. Road warriors, ask your doctor and/or pharmacist for the best storage methods based on the type(s) of medications you take and your travel plans. For example, if you need an EpiPen, your pharmacist will likely recommend a cool pack that will keep it at the correct temperature. An easy DIY option for traveling with meds that need to be kept cool: Buy some reusable ice pouches and position your meds in a sturdy insulated bag, lunchbox or small cooler with the frozen pouches. If you’re taking a long-haul flight, work out your storage method beforehand with your airline. It could be as simple as your flight attendant providing you with fresh ice (don’t forget those zip-top bags!) or letting you use the airplane’s fridge. Speaking of the fridge — you’ll also want to confirm that your destination accommodation has one that is accessible to you. If you’re having the medications shipped to you, have them overnighted, if possible. Look at your medications before you take them. NEVER take any medication that has changed color or consistency or that has an unusual odor (regardless of the expiration date). You can’t always tell if there is a problem just by looking, but this definitely a good place to start. Eco-friendly tip: If you need to discard medications, don’t flush them down the toilet where they could make their way into the water supply. Try mixing it with coffee grounds or another material and put the mixture in the trash. 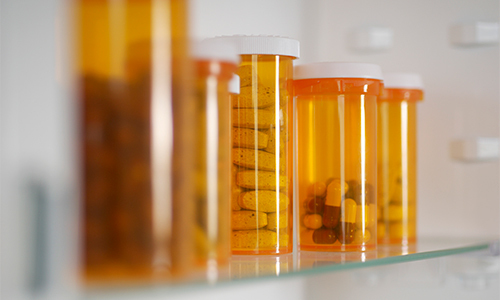 Some cities even have annual take-back programs to safely dispose of medicines. And don’t forget: if you’re traveling and think your medications were compromised by extreme heat, give us a call and we’ll give you a hand. Good Sam TravelAssist Members can utilize our 24/7 prescription assistance services any time they travel more than 50 miles from home.